Oxfordshire's leading health authority has suspended referrals to some gynaecology services in the county. The clinical commissioning group (OCCG) said "capacity challenges" at hospitals was leading some women to wait up to 40 weeks for an appointment. GPs have been told to refer patients to Buckinghamshire, Berkshire and Warwickshire until at least July. Patients with suspected cancer, recurrent miscarriages or fertility issues will still be seen. 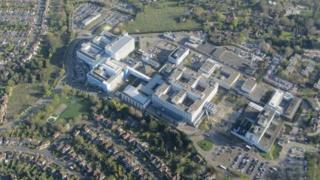 Oxford University Hospitals Trust, which provides NHS gynaecology services for the county, said it was a "temporary measure" to make sure women were seen "in a more timely fashion". OCCG said more than 1,300 women could be affected by the issue. Women with pelvic pain, general gynaecology issues, urogynaecology, endometriosis, and menopause complaints, began being referred outside of the county on 1 April. GPs can also refer patients to private health providers on behalf of the NHS in Banbury, Berkshire and Buckinghamshire. Director of clinical services Sara Randall said the hospital was looking at increasing operating theatre capacity, "expanding the gynaecology team", and increasing community-based gynaecology care with OCCG. In 2017 the clinical commissioning group was criticised for voting to permanently downgrade maternity services at the Horton General Hospital in Banbury. OCCG has also said it is considering discontinuing NHS vasectomies in Oxfordshire to save money.